After a grueling 18 holes of golf at Nicklaus North Golf Course, we were famished. Boy, stepping on those pedals in the golf cart was really tiring! On some holes, we even had to walk to our ball as the carts weren't allowed on the fairway. Imagine that! If it weren't for the staff helping us carry our clubs from the car to the golf cart, we could've thrown out our backs! And let's not even get into bending down and placing our ball on the tee... So much physical activity! We deserved tasty food. 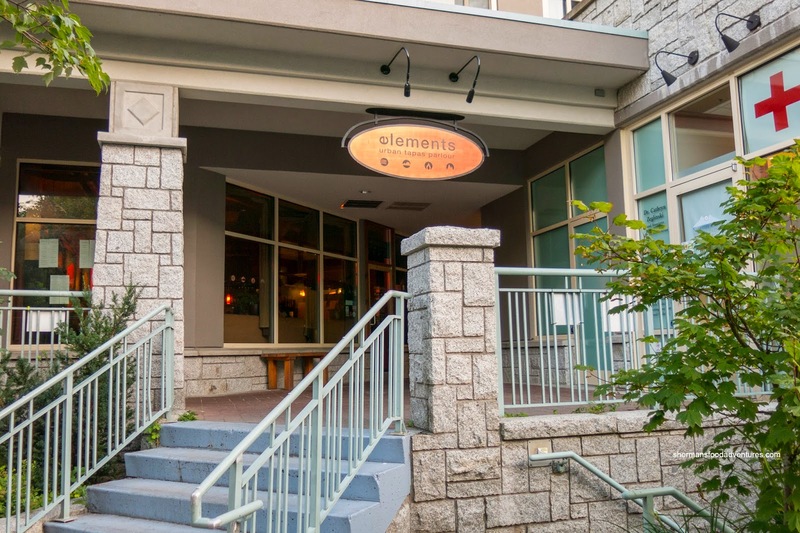 Hence, we headed over to Elements Urban Tapas for some share plates and a couple pitchers of sangria. 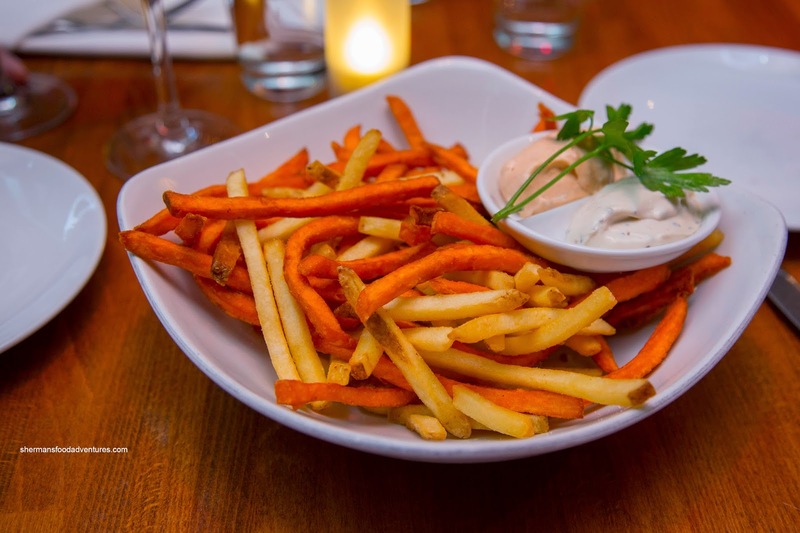 After mulling over the menu, we decided to get 7 items to share beginning with the Two-Tone Frites with roasted tomato & black pepper aiolis. Consisting of both potato and yam fries, this was a simple yet surprisingly addictive and attractive plate of food. Seemingly equally firmly crisp while still retaining a bit of starchiness, the fries did not lose their texture, even to the last piece. Although each dip was good, I preferred the black pepper aioli due to the pepperiness combined with its mild smoothness. On the contrary, the roasted tomato was much more subtle (intentionally of course) with a very mild sweet tang. 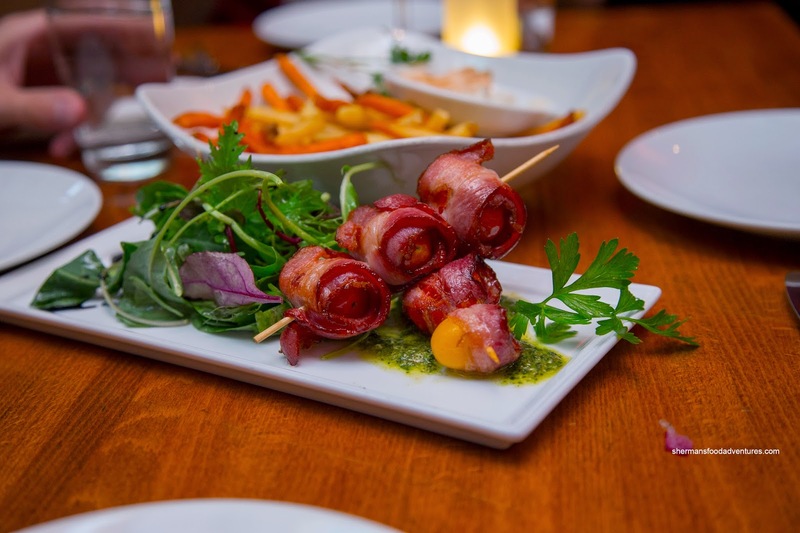 With another seemingly straightforward dish, the Wild Boar Bacon-Wrapped Baby Tomatoes were little explosions of flavour. The plump, sweet and slightly tart tomatoes were accented by the saltiness of the rendered and crisp bacon. Although the pesto was another layer of flavour (basil herbiness), it wasn't even necessary since the tomatoes were fine on their own. 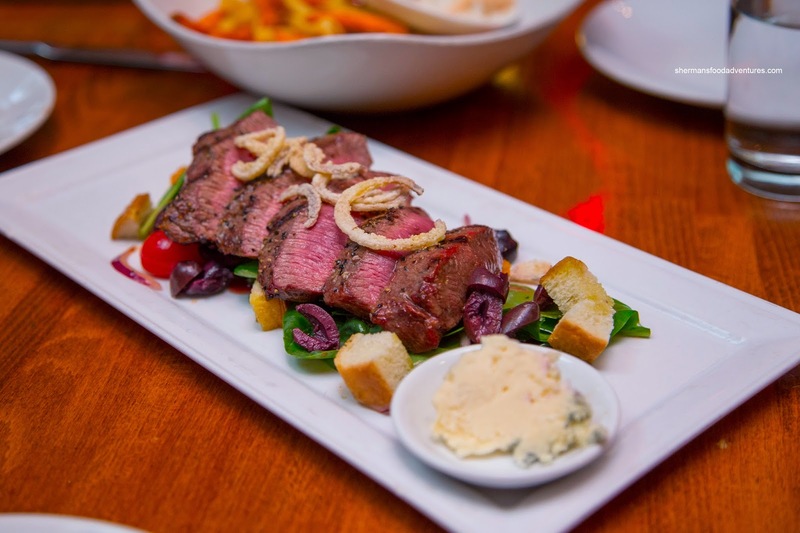 Onto some bigger dishes, we had the Grilled Flat Iron Steak Salad with spinach, croutons, tomatoes, olives, blue cheese, crispy shallots and sundried tomato dressing. We got the blue cheese on the side because Chill and Snake didn't want any... Wimps! Anyways, the steak was prepared a beautiful medium rare. It was well-charred on the outside while juicy and moist inside. Naturally, for myself, I thought the blue cheese went well with the steak providing a salty sharp flavour. 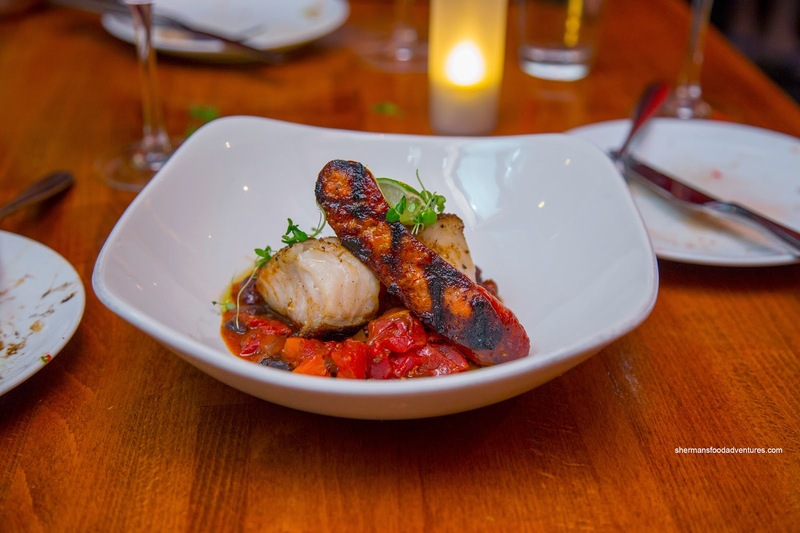 Next up was the Blackened Pacific Ling Cod with bean cassoulet and grilled chorizo. I found the cod to be flaky and firm while lacking in inherent flavours. However, the spicy and salty chorizo were more than able to alleviate that problem. The tomato-based cassoulet was neutral-tasting except for some spice at the tail end. 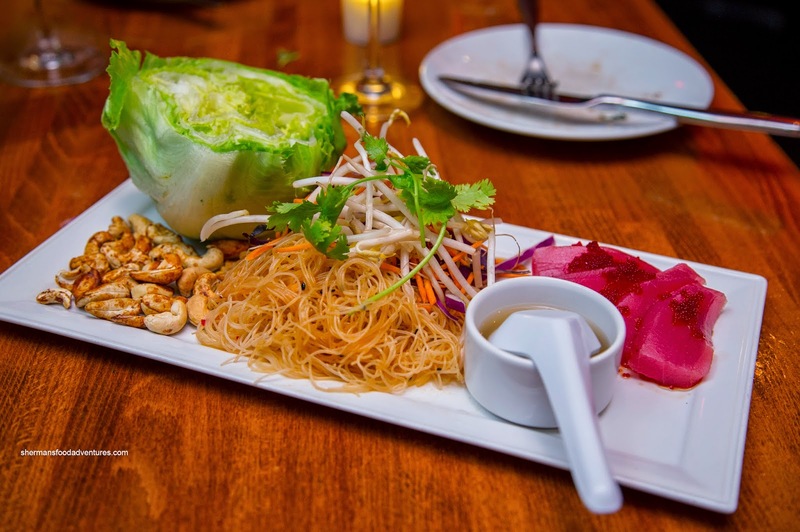 Although beautifully plated and carefully prepared, the Lettuce Cups with Ahi Tuna was not a crowd-pleaser at our table. Nothing particularly wrong with the individual components as the tuna was nicely textured (soft, but not mushy) and naturally sweet while the lettuce was fresh, crisp and properly trimmed. The rest of the veggies, soy roasted cashews and seasoned rice noodles added even more textures and in the case of the cashews, an aromaticness. Snake, in particular, felt the dish was lacking impact as it was full of different textures, but at the same time, was missing that one flavourful component. For myself, I thought it was fine as it was supposed to be a lighter dish where one could regulate the strength of flavours with the nuoc cham. Another lighter dish of sorts was the Steamed Westcoast Mussels in a coconut red curry with lemongrass and kaffir lime. 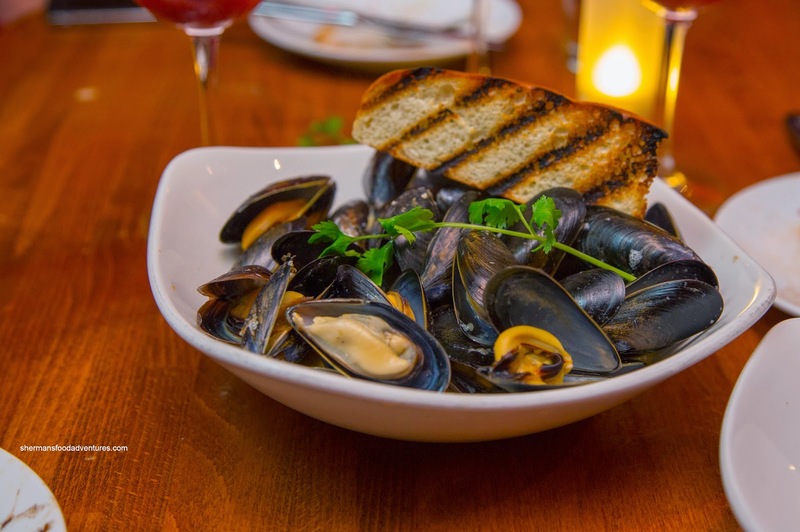 The mussels were buttery and plump while bathed in a creamy aromatic broth that had just the right amount of spice and acidity. I could really taste the individual components especially the coconut milk and curry. We ended off the meal with the Slow Cooked Pork Belly with bacon & rosemary bread pudding, apple butter and maple cider glaze. 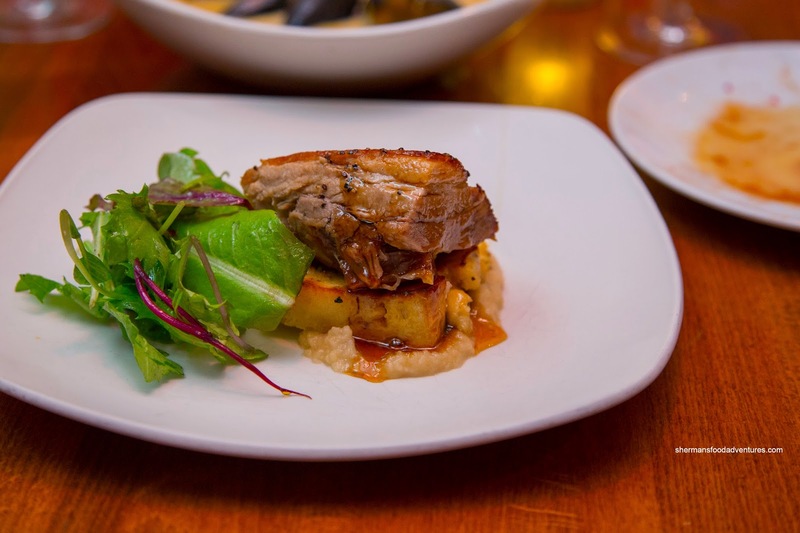 Meaty and fork tender, the pork belly exhibited a natural roast pork essence that was accented by mildly sweet apple butter. I would've liked to see even more zing from the glaze, but it was full of depth nonetheless. The bread pudding was pleasant being soft and sweet with the aroma of rosemary. However, I would've liked to see something crispy to provide some textural balance (the skin wasn't crispy). Overall, we thought the meal was good with carefully prepared eats. Prices are on the higher end, but we're talking about Whistler here and whenever "tapas" is in the name, you know it won't be cheap.